Sugar’s Explosion In Britain: Slave Driven, Technologically Fueled, or the result of Free Trade? By the twentieth century, sugar had become a common component of the English diet. Several factors led to this development, two of which are the proliferation of slavery in the New World, and advancements in technology that made larger scale production possible. While technology, after the abolition of slavery, continued to play a role in the success of sugar production, sugar prices would likely not have dropped to the degree they did, had it not been for a shift away from British protectionism, a policy that had formerly limited competition in the sugar industry. The reduction of sugar prices is what allowed the product to become so integrated in the diet of everyday people. One cannot ignore the role the slavery played in the production of sugar into the mid to late nineteenth century. As Sidney Mintz states, British colonists in the Caribbean had began to think about sugar production close to the middle of the seventeenth century. As tobacco production began to be supplanted by sugar production, plantations began to develop, and increasingly, small farms became a thing of the past, and slavery a more popular form of labor than indentured servitude. As Mintz points out, slavery maintained its crucial role in sugar production until the Haitian Revolution, which concluded in 1803. This graph of UK per capita sugar consumption over time (from this article) shows that sugar consumption continued to increase well into the nineteenth century. So, while slavery may have played a pivotal role in sugar production in its day, it cannot, however, be given credit for the ultimate explosion of sugar consumption in Britain. Technological advances also played a key role in sugar production. As Mintz states, until the nineteenth century, “mechanical force was [still] an imperfect and incomplete substitute for manual labor.” However, around the middle of the 1800’s, there were drastic improvements in the technology of the sugar industry, as evident by “[i]mmense improvements in grinding capacity, cane varieties, pest control and cultivation methods, increasing use of machinery, and revolutionary changes in transportation eventuated in vast new agro-industrial complexes.” One such technological improvement was the use of steam powered sugar mills. Another was the multiple effect evaporator, which introduced a cheaper and safer way of evaporating sugar cane juice. As slavery ended in several European countries in the nineteenth century, there was a decrease in the labor available for Caribbean planters, as former slaves sought to escape the plantation. The planters who were most able to utilize technological improvements got a leg up over their peers in the face of increased competition in the sugar market. It seems that technology helped to compensate for emancipation’s effects on the labor supply. This price reduction ended, or at least slowed, with the end of competition. It seems unlikely that the sugar producers in the English West Indies would have reduced their prices as much as sugar prices fell following the end of protectionism, if they had still enjoyed the lack of competition that protectionism afforded them. I contend that although new technological advances improving the means of sugar production might still have led to a reduction in sugar prices, this reduction would not have been as great without this shift in British policy. The change from protectionism to some semblance of free trade was completed by 1870. When they removed “barriers to ‘free’ trade… [British elites made it] possible for the world’s cheapest sugars to reach the widest possible market in Britain.” While slavery, in its time, had some impact in the flourishing of the sugar industry, and technology surely played a role as well, the results of the British departure from protectionism allowed the competition that also helped to drive down sugar prices, which allowed sugar to be consumed more widely by the English population. Davis, Ralph. “English Foreign Trade, 1660-1700.” The Economic History Review, New Series, 7, no. 2 (1954): 152. doi:10.2307/2591619. Mintz, Sidney W. Sweetness and Power: The Place of Sugar in Modern History. New York: Penguin Books, 1986, c1985. Sidney Mintz., Woodville K. Marshall, Mary Karasch, and Richard Frucht. “Slavery and the Rise of Peasantries [with Commentary].” Historical Reflections / Réflexions Historiques 6, no. 1 (1979): p.215. Sidney Mintz. Sweetness and Power: The Place of Sugar in Modern History, p. 61. Ralph Davis. “English Foreign Trade, 1660-1700.” The Economic History Review, New Series, 7, no. 2 (1954): 152. Every spring, particularly around Easter, the iconic Cadbury Creme Eggs (pictured above) command significant shelf space in nearly every store. For many decades people around the world have received immense pleasure from cracking the egg’s chocolate shell open to release the gooey and cloyingly sweet yellow and white fondant, which resembles a chicken egg, but tastes drastically different. Before the idea for the traditional Cadbury Creme Egg was hatched, the Cadbury company struggled to sustain its favor with the public. Chocolate adulteration scandals and questionable business ethics created public relations nightmares and could have ruined the chocolate giant. Perhaps you will be surprised (or not) to learn that Cadbury’s idyllic Quaker village in Bournville, England, constructed during a time of chocolate success and expansion, revealed a lifestyle and way of conducting business very contradictory to the laborers who procured the cocoa. Despite the Quaker values of the Cadbury family, they made some questionable decisions in terms of business ethics. When it came to the adulteration of chocolate, which littered the chocolate industry during the 1800s, and cocoa sourced under slave-like conditions, the Cadbury’s either turned a blind-eye or lacked proper oversight throughout their production chain. In these instances, it appears economic benefits outweighed moral duties. While other companies were caught adding ground brick to their chocolate confections, Cadbury admitted to adding starch and flour to their products. 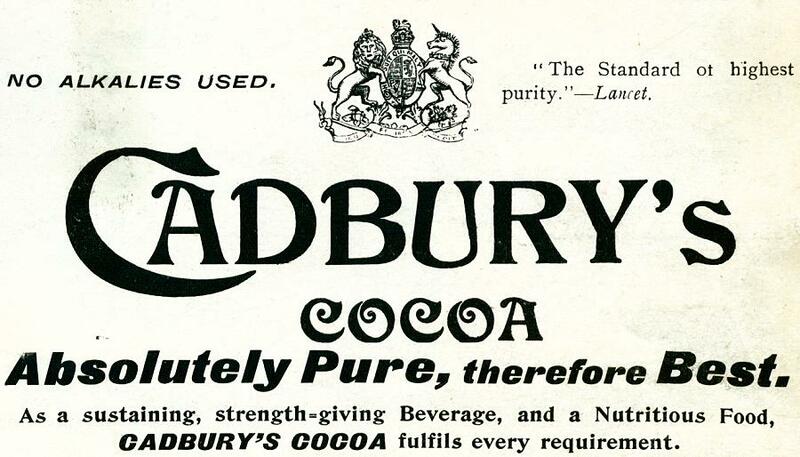 By the end of the 19th century, the Cadbury chocolate adulteration scandals had been counteracted with advertising campaigns promoting their purity promise: “Absolutely Pure, Therefore Best” (Coe & Coe 2013, 245). This was successful and a period of growth followed. Keeping in line with the company’s Quaker values and its paternalistic interest in its workers, George Cadbury constructed a model village, Bournville, for Cadbury company workers complete with ample housing, recreation facilities, and a school (Satre 2005). The photograph below reveals just a small section of the Bournville Village circa 1903 with its clean, wide streets and large housing units surrounded by well-groomed landscaping. Although the company expected a high level of productivity and reliability from its chocolate factory workers during the 48-hour workweek, Cadbury clearly invested back into the community to create a family-like atmosphere. However, this idyllic chocolate community and way of life did not extend down to the cocoa laborers, perhaps because they were indirectly working for Cadbury. During the early 1900s, the Cadbury company relied on the islands of São Tomé and Príncipe for nearly half of its cocoa beans. Lowell Satre (2005, 24), author of Chocolate on Trial: Slavery, Politics, and the Ethics of Business, reports that in 1902, Cadbury alone purchased 20% of the cocoa produced on those two islands. Just one year prior, in 1901, Cadbury became aware of the post-abolition slavery practices on São Tomé and Príncipe after the release of some publications from British investigative journalist, Henry Nevinson (Martin 2017). However appalled George Cadbury may have been by the thought of enslaved workers procuring the cocoa his company processed, his 7-year remiss reaction failed to show any grave concern. Catherine Higgs (2012, 137), author of Chocolate Islands: Cocoa, Slavery, and Colonial Africa reveals Cadbury, “rejected the idea of a boycott, since it would rob the chocolate makers of the leverage they enjoyed as major buyers of São Toméan cocoa.” Clearly boycotting slave-produced cocoa purely on moral grounds was not as important as economic clout and would only be used as a last resort tactic unless another economically viable option became available. Technically, [legally] the cocoa laborers worked under a type of indentured servitude, as serviçaes, and could be repatriated after their contracts ended, though it was inefficaciously enforced. Despite Cadbury’s correspondence with island visitors who reported “good treatment” of workers, the death rate was still astronomical, with the life expectancy of an enslaved cocoa worker on São Tomé and Príncipe to be less than a decade (Higgs 2012 and Martin 2017). Even though cocoa laborers on the islands were not technically Cadbury employees, since the Cadbury company sourced a significant amount of their cocoa beans there, they were part of the demand issue that kept the laborers working more hours than required by their British counterparts. Thus, it begs the question, should Cadbury have been responsible for allowing these conditions to persist or aiding in alleviating them? Not only did the Cadbury company benefit from the cheap commodity produced by slave labor, but the Portuguese government did also. Knowing this, perhaps the British government should have shared in the responsibility as well. Cadbury’s moral and social responsibility seemed to be reflected more in word than in deed. Although Cadbury investigated the conditions in São Tomé over several years, both in person and through correspondences with adversaries, he did not institute a boycott of slave-grown cocoa for nearly a decade after first learning of the severe conditions. Meanwhile, the company profited. Part of the reason for the delay was the thought that if English chocolate companies did not buy cocoa from São Tomé and Príncipe, “someone else would” (Satre 2005). Unfortunately, this was true. When the Cadbury company finally ceased purchasing cocoa from the islands, along with a few other English chocolate firms, U.S. based chocolate companies swooped in. Cadbury had not miraculously decided to finally take the high road after eight years though. Two months prior, Cadbury purchased land on the Gold Coast (present day Ghana), with plans to build a factory site (Higgs 2012). While this new cocoa district was not experiencing the slave-like conditions of the islands, it offered a different form of cheap labor, which could be considered questionable labor practices as well. Thus, this move to the Gold Coast was economically favorable and seemed to pacify public concerns. Inequalities still persisted between the chocolate factory workers in Britain and the cocoa harvesters in Africa. One thing is clear: satisfying commercial interests took priority. The battle between economic viability, moral duty and social responsibility still persists in the chocolate world today. In this post, “cocoa” is synonymous with cacao or cacao beans; the raw product or unprocessed commodity used to make chocolate. Coe, Sophie D. and Michael D. Coe. 2013. The True History of Chocolate, 3rd ed. London: Thames & Hudson Ltd.
Higgs, Catherine. 2012. Chocolate Islands: Cocoa, Slavery, and Colonial Africa. Athens: Ohio University Press. Martin, Carla. 2017. “Slavery and Forced Labor in the Atlantic World.” Lecture, Chocolate, Culture and the Politics of Food from Harvard Extension School, Cambridge, Massachusetts, March 1. Satre, Lowell J. 2005. Chocolate on Trial: Slavery, Politics, and the Ethics of Business. Athens: Ohio University Press. If there’s one food to pay attention to, it’s sugar. Sugar has experienced an exponential rise in Britain within the past few centuries and the numbers say it all—Britain’s annual consumption of sugar per person was 4 lbs in 1704, 18 lbs in 1800, and 90 lbs in 1901, nearly a 23-fold increase in the span of roughly two hundred years (“Britain”). There are several potential factors for the changes in British sugar consumption. However, the main factors are sugar’s various uses and its eventual democratization. Analyzing the causes of sugar consumption are vital to understanding the place of sugar in British society, but it also provides valuable insight into how the economy changed so that sugar demands could be met. This graph tracks the rise in sugar consumption in the United Kingdom from 1815 onward, giving a great visual representation of the astronomical increases in sugar consumption throughout British history. Sugar had five primary uses as a: 1) spice, 2) medicine, 3) decoration, 4) preservative, and 5) sweetener (Mintz 79). In the beginning, when sugar was first introduced to Europe in 1100 AD, it was primarily viewed as a spice, similar to cardamom or pepper (79). It was often added into recipes that weren’t overtly sweet dishes and combined with other spices (85). However, sugar as a spice peaked in the 16th century as sugar became more plentiful and as its other uses dominated. Another initial use of sugar that eventually phased out was sugar’s medical uses, which was originally was adopted from Arab pharmacology (80). Many physicians even into the 18th century were fervent proponents of sugar as a health food. For example, a physician, Dr. Frederick Slare, attributes his robust health to his daily dose of sugar after dinner (“Sugar”). Although sugar as a spice and medicine were important, perhaps more important for our purposes of tracking the historical spike in its consumption are sugar’s uses as decoration, a preservative and a sweetener. First, we will discuss sugar as decoration, which was in full swing among the upper class by the 16th century. Sugar was molded into sculptures, also known as subtleties, and were used to display the host’s wealth, power and status (as seen below) (Mintz 90). As sugar remained a luxury up until the 1850s, sugar’s decorative purposes, at least initially, was exclusive to the upper echelons. Despite this restriction, there was a gradual increase in sugar imports (83). Sugar’s ability to exhibit one’s status was one cause for its increase, albeit a relatively minute increase compared to what was to come. Sugar decoration from "The Edible Monument: The Art of Food for Festivals," an exhibit at the Getty Center in Los Angeles. These decorations could have served as centerpieces at an upper class social gathering. Sugar decoration was a show of power as it was only accessible by few in its initial stages. These decorations were to be admired by guests as they ate their meals. At the end of the party, guests could take pieces of the decoration to eat or to keep as a souvenir (Swanson). The last two major uses of sugar were as a preservative and sweetener, which were on a mass basis. Sugar as a sweetener became popular with the introduction of tea in the late 17th century (108). Not only did sugar make this bitter liquid more palatable, but it increased the caloric intake of the beverage and it also helped ritualize the act of “tea time” (110). Furthermore, this became a popular beverage among the working class as it was hot, sweet and stimulating; most importantly, it was cheap and quick to prepare (110). Sugar as a sweetener helped make it become an item of mass consumption, but its role as a preservative was equally important. The preservative qualities of sugar, particularly its ability to preserve fruits, had been known for many years, but it had been strictly reserved for nobility in the 15th century (123). Preserved fruits remained luxuries for a longer period than sweetened tea and it wasn’t until the mid-19th century that jam consumption was taken up by the working class. It quickly became an indispensable food for its convenience (125). While, in its initial stages, sugar was only accessible to the wealthy and was a luxury instead of a commodity, its uses spread downwards, slowly but surely. Through this process, sugar largely lost its marker as a distinction of wealth, but mass consumption is what made sugar profitable and a dietary staple (95). One way or the other, through these various uses, sugar found a way into British homes. Now that we’ve covered the uses of sugar, how did it come to be that the working class obtained sugar, which was originally a rarity? Democratization of sugar was possible due to the economic changes that occurred to accommodate for the growing demands. As the consumption of sugar in England rose, so did its production, particularly in the British West Indies. A consequence of this was the dramatic increase in the slave trade. This fed into this proto-capitalistic system of sugar production and made sugar cheaper (107). Furthermore, the economy of sugar was entangled within the trade networks of tea, coffee and chocolate, which all found a large market in Britain, particularly tea. Lastly, events like the free-trade movement in the mid-19th century and increasing foreign imports also helped sugar prices to fall markedly, allowing for the widespread consumption of sugar (126). This image is of the Triangular Trade, showing how sugar fit into the trade network involving slaves, raw materials and other finished goods. Ships would deliver enslaved people to the West Indies and Americas. Raw materials like rum, tobacco, and sugar would be delivered to England to be turned into manufactured goods. Mintz, an anthropologist, reiterates that it wasn’t solely sugar’s sweetness that resulted in its exponential growth (135). There were many sweet foods like honey and dates long, long before sugar came on the scene (“How”). It was a combination of different factors that led to the mass consumption of sugar in a relatively short period of time. It seems that sugar’s uses, especially as a caloric source, preservative and sweetener, in combination with the accommodating economy helped solidify sugar as king in England. “Britain Is Built on Sugar: Our National Sweet Tooth Defines Us.” The Guardian. Guardian News and Media, 12 Oct. 2007. Web. 07 Mar. 2016. “How Sugar Arrived in Europe.” Dansukker. Web. 07 Mar. 2016. “Sugar in Britain.” Sugar in Britain. Web. 07 Mar. 2016. Swanson, Abbie. “Let Them Eat Sugar Sculpture! The Getty Celebrates Edible Table Art.” NPR. NPR, 20 Nov. 2015. Web. 10 Mar. 2016. Sugar as a decorative material had to be mixed with ingredients such as gum Arabic and then mixed into a claylike substance that could be formed into various sculptures of any size, baked, and once hardened, decorated, displayed, then eaten. This tradition most likely trickled into Europe from marzipan-heavy North Africa via Italy, then to France in the 13th century, then to England. (Mintz 87). Such displays were called “subtleties” and in many cases marked intervals between banquet courses at royal feasts. The subtleties were in the form of animals, buildings, etc. and were admired and consumed. Subtleties were confined to the kingship, noble classes, the knighthood and the clergy due to the high price of sugar and the vast quantity needed. Originally the sugar sculptures were simply meant to be a marriage of craftsmanship and confectionary skill, but over time could also very well serve as political or satirical symbols conveying messages to guests consuming it. Many of the sugar sculptures served at the coronation of Henry VI did just that; they confirmed the king’s rights, privileges and inherent authority, highlighting the unique phenomenon of a food that could be artistically formed, admired as a work, interpreted for meaning, and then eaten. (Mintz 89). Writings from Robert May (a royal cook in Britain) in the later 1600s describe elaborate works of art—a sugar stag that bleeds claret wine when an arrow is removed from its flank, a sugar castle that fires its artillery at a man of war, and gilded sugar pies filled with live birds. (Mintz 93). Over time, the aspiring upper and middle classes began to combine “course-paste” sugar creations of their own. These new concoctions were much simpler during the mid 1700s, as evidenced by some recipes in Mrs. Hannah Glasse’s cookbooks—i.e. fruit and vegetable molds, and even a hedgehog. (Mintz 93). The lack of extravagance in these newer designs is understandable due to the fact that sugar by this time had become much cheaper and more accessible to lower class in British society. As sugar continued to become more plentiful in England, its strength as an icon of power and social status deteriorated while it simultaneously became an overwhelming source of profit. (Solow 112). Sugar became a different substance for the wealthy to enjoy. In many ways, it still remained a symbol of power for the upper classes who profited from the Caribbean sugar trade, but not in the ways it had been in the past. (Solow 103-134). As a result, the practice of sugar as elaborate decorations died out. In all, the relationship between trade and social stratification is evident when studying the tradition of sugar subtleties. Today, chefs and artists around the world continue to create sugar sculptures, but the market for them is small and usually used for events such as historical reenactments. 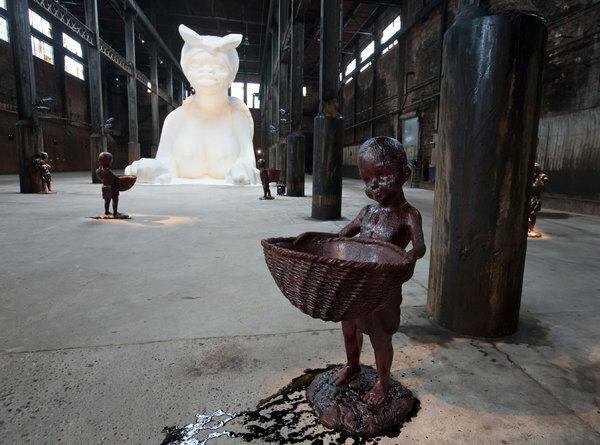 Artist Kara Walker in New York City recently installed a 35 foot tall “sugar sphinx” as commentary on the history of blackness, sugar, and European commerce, an echo of the days of Henry VI using sugar sculptures to make political statements. (Smith). In conclusion, the effects of the democratization of sugar consumption in Britain still continue today; sugary foods such as candies are now consumed and enjoyed by people of all classes and ages in the Western world, proof that changes in trade can transform the social and political meanings behind a food product among classes in a society. A modern day sugar baker at work creating surrealist sculptures utilizing modern technologies. Mints, Sidney. Sweetness and Power. New York: Viking Penguin Inc. 1985. Print. Solow, Barbara L., British Capitalism and Caribbean Slavery: The Legacy of Eric Williams. Cambridge: Cambridge University Press. 1987. Print. Victoria and Albert Museum. “Power of Making: Sugar Sculpture by Jacquy Pfeiffer at the Victoria and Albert Museum.” Online video clip. Youtube. Youtube. 9 September 2011. Web. 10 March 2015. The degree of ubiquity of sugar in the modern American diet would have been staggering to any European citizen in centuries past. One need only look to Candy Crush, an incredibly popular mobile game thematically designed around solving puzzles with sugary candy in a sweet-based kingdom, to understand just how prevalent sugar has become in diets and even pop culture. How did sugar transition from a luxury good to an omnipresent culinary additive across the span of a few centuries? Sidney Mintz describes how “in 1000 AD, few Europeans knew of the existence of sucrose, or cane sugar. But soon after they learned about it; by 1650, in England the nobility and the wealthy had become inveterate sugar eaters […] by no later than 1800, sugar had become a necessity – albeit a costly and rare one – in the diet of every English person; by 1900, it was supplying nearly one-fifth of the calories of the English diet” (Mintz 5-6). While this summarizes the transition nicely, immeasurable context is omitted by considering this statement alone. Due to low production costs stemming from the overseas plantation system, supplying sugar to the British public became an increasingly easy task. As a result, a relationship of mutual causality emerged, with the explosive popularity of both sugar and chocolate from the 17th century onwards being nontrivially linked to sugar’s use as a common additive in imported luxuries like cacao. To contextualize sugar’s rise in England, it is important to first understand how it came to arrive there. The most notable production method for sugar was its export from cane sugar plantations in British colonies in the Americas. 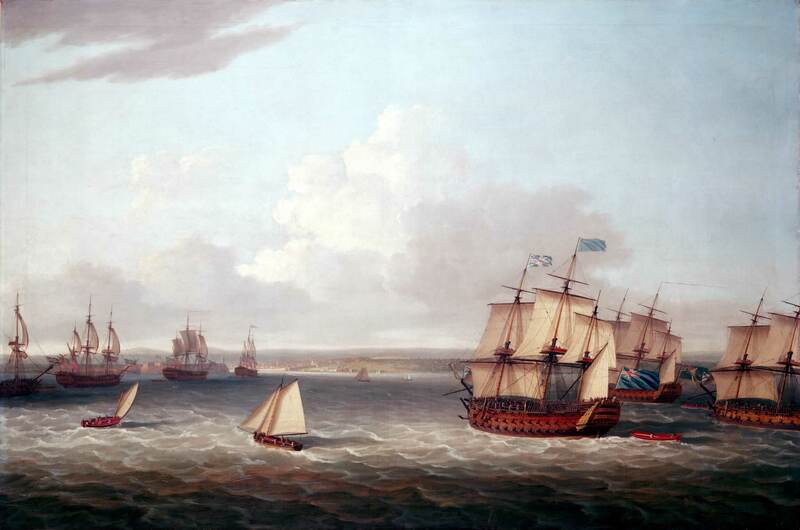 While other nations followed suit, the British were uniquely effective at this – as Mintz writes, “England fought the most, conquered the most colonies, imported the most slaves, and went further and fastest in creating a plantation system. The most important product of that system was sugar” (Mintz 38). Due to low labor costs resulting from the mass employ of slaves on these plantations, production cost was relatively low for a good that was a relative luxury. From 1655, when sugar was originally introduced in England, to 1753, consumption of sugar rose from around 1,000 hogsheads to 104,000 hogsheads (Mintz 39). This implies that price had been driven down as a result of plantations becoming more efficient and widespread, and the resulting effect was that sugar became more common in English diets. While plummeting sugar costs certainly helped enhance sugar’s popularity in England, they cannot be held solely accountable for the magnitude of its rise. Rather, luxury imports such as chocolate (as well as tea and coffee) served to amplify the effects of lowering sugar prices in the 17th century, providing a new vessel for the introduction of sugar into the English diet. Mintz speculates that this connection makes sense due to the inherently bitter nature of these imports; adding sugar tempers the bitter flavor with sweetness, which tends to be appreciated by everyone whereas bitter tastes often need to be acquired (Mintz 109-110). This is the first half of the link of mutual causality between chocolate and sugar – without the prevalence and availability of sugar, the rise of chocolate in England would not have been possible. Here, the other half of the link of mutual causality between chocolate and sugar becomes more apparent. Sugar’s rise in popularity is partially attributable to the availability of new, uniquely bitter products like chocolate to which it could be added during the production process. Additionally, the spread of these products was timed extremely conveniently with the onset of the Industrial Revolution. The availability of new manufacturing processes opened doors for combining sugar and chocolate in ways that proved exciting for consumers. For instance, in 1828 Coenraad Johannes Van Houten patented a proprietary means of alkalizing and pressing cocoa to create cocoa powder, which could be easily combined with sugar in production of chocolate. This “made possible the large-scale manufacture of cheap chocolate for the masses, in both powdered and solid form” (Coe and Coe, 242). Consumer chocolate production followed, with Joseph Fry manufacturing individually packaged chocolate bars in 1847, and John Cadbury founding his company in 1824 in Birmingham to introduce variety in the types of available confections. Later innovations such as Rudolphe Lindt’s conche near the end of the 19th century helped streamline the addition of sugar even further, with the conche being used to distribute mixed ingredients better, to remove granularity, and to reduce particle size (which may have been important when adding something that begins as granular as sugar) (Coe and Coe 251). With a new set of manufacturing techniques and an exciting array of more affordable chocolate confections, sugar was solidified as a staple of the British diet by the dawn of the 20th century. Of course, experimentation and implementation at scale have only expanded in the years since, with massive corporations such as Nestle, The Hershey Company, Lindt, Mars, and others dominating commercial markets. Nevertheless, the current state of the industry never could have been possible had sugar and chocolate both not arrived in the fashion that they did. Each depended on the other to grow its own popularity, laying out a relationship of mutual causality that harmonized to the tune of rapid growth across a few centuries. Mintz, Sidney. Sweetness and Power: The Place of Sugar in Modern History. New York: Viking, 1985. Print. Schroeter, John Henry. “Our Richmond Heritage.” Richmond Jamaica. Web. 13 Mar. 2015. <http://www.richmondjamaica.com/heritage.html&gt;. (USER) Spencer Chocolate. “Chocolate Conche.” YouTube. YouTube, 3 Sept. 2014. Web. 13 Mar. 2015. <https://www.youtube.com/watch?v=EKQiaKrh1_o&gt;. “Obesity, Type 2 Diabetes, and Fructose.” Office of Science Outreach. Indiana University. Web. 13 Mar. 2015. <http://www.indiana.edu/~oso/Fructose/Fructose.html&gt;. Throughout the 19th Century, the demand for chocolate in the UK and around the world was ever increasing, with far more of its consumption being performed by the masses. This rise in demand led to a large increase in the amount of adulteration present in the production of chocolate. These high levels of adulteration eventually led to the passing of multiple food acts in the UK, and, more importantly, a demand by the public for pure, unadulterated chocolate products. I believe it can be argued that the rise and fall of chocolate adulteration in the 1800’s was critical to the growth of Cadbury from a small business to a worldwide company, and, thus, was a key factor in shaping the chocolate industry we see today. The rising demand for chocolate during the early stages of the 18th century made it a very attractive industry for immoral producers and merchants in the UK as well as in many other countries. In France, for example, it is said that around the time of the monarchy restoration in 1815, chocolate was being adulterated with foods such as powdered dried peas and potato starch, making its production cheaper (Coe, 243). At this time, it was feared that adulteration was not only occurring in chocolate but also in other foods and medicines, with some of the adulterants possibly being poisonous (British Library). Taken from the British magazine ‘Punch’ in 1858, this cartoon shows a medicine being adulterated with Plaster of Paris and Arsenic. It reflects the fear in the UK of adulteration during this time period. 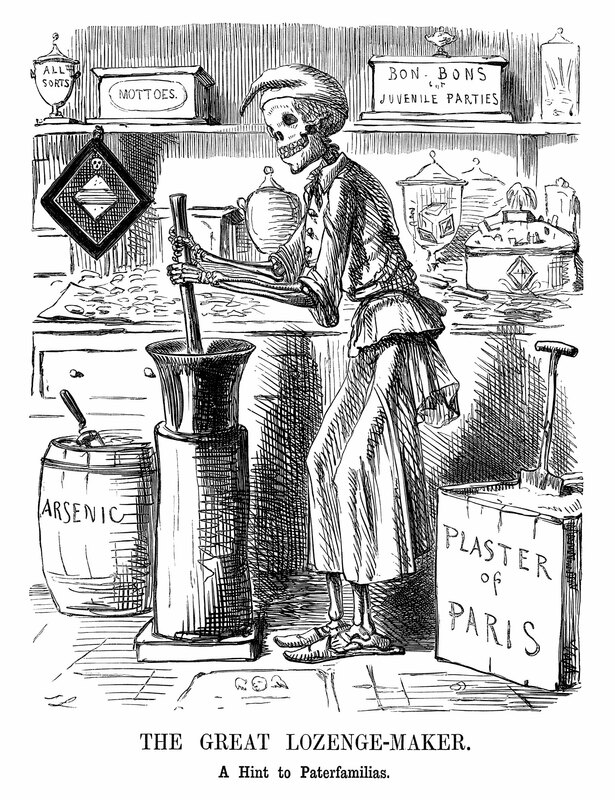 Eventually, after increased suspicion of adulteration in the production of multiple goods in the country, the British Government decided to take action in 1850 with the creation of a health commission for the analysis of foods, which was operated by ‘The Lancet’, a British medical journal. The results of the analysis were presented with great detail in ‘Food: Adulterations and Methods for their Detection’ by Arthur Hassall. They confirmed the suspicions of many that a high number of foods, including chocolate, involved adulteration within their production process. Out of the 70 samples of chocolate taken in the UK, it was said that at least 39 of them contained traces of ground bricks used to alter the colour of the product. Furthermore, samples were also found to contain potato starch and, in some cases, animal fat, which was used as a substitute for cocoa butter (Hassall). With the level of discontent amongst the public growing, especially with the newly produced results from the ‘The Lancet’, the British government took a stand against food adulteration with the British Food and Drug Act in 1860 and the Adulteration of Food Act in 1872. This led to an increase in the knowledge of food adulteration amongst the public and thus a sharp rise in the demand for pure, unadulterated foods, including pure chocolate (Coe, 245). Because of this, many chocolate companies faced high pressure to rid adulteration from their production process, and Cadbury, which at the time was a relatively small business, fully capitalised on this opportunity (Cadbury). Initially admitting to the fact that they had previously adulterated their chocolate with starch and flour, Cadbury used the rising demand for pure foods to advertise their new ‘Cocoa Essence’ product, which made chocolate via the use of the cocoa press invented by Coenraad Johannes Van Houten. The cocoa press reduced the amount of cocoa butter in the chocolate, meaning that adulterations did not have to be made to counteract the taste of it. In 1866, Cadbury was the first chocolate company in the UK to use this technique, and thus the only company that produced unadulterated chocolate. Using this fact to their advantage, Cadbury focused on the purity of their product when advertising ‘Cocoa Essence’, using the now iconic slogan ‘absolutely pure, therefore the best’ (Cadbury). Due to high demand for pure foods, this marketing campaign led to a rapid increase in sales for Cadburys, whilst other, bigger companies such as Fry & Sons, suffered, as they did not have the technology or time to produce mass amounts of unadulterated chocolate (Coe, 245). By 1897, Cadbury’s chocolate sales had surpassed those of the previously superior Fry & Sons, making it the largest chocolate distributor in the UK (Coe, 245). Today, Cadbury is one of the biggest chocolate company’s in the world, famous for its ‘Dairy Milk’ chocolate bar, and highly influential in terms of both the production and tastes seen in todays chocolate industry (Cadbury). Thus, it can be said that the increase of food adulteration and eventual government intervention to prevent it in 19th century Britain was highly influential to the chocolate industry we see today, as without it, there would not have been a high demand for pure, unadulterated chocolate, and Cadbury may have remained a small business instead of the worldwide industry leader that it has become. 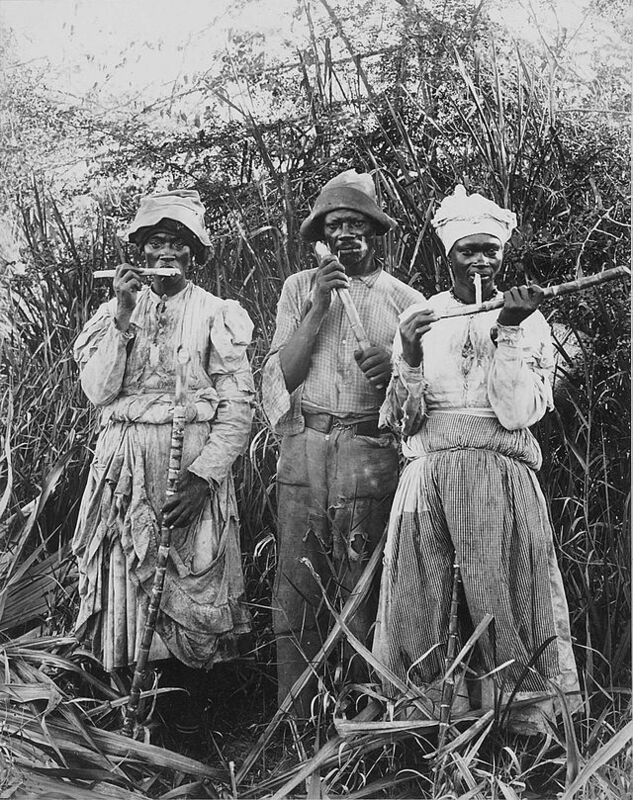 Laborers cutting sugar cane in Jamaica in the 1880s. British sugar consumption has changed dramatically over the past several hundred years. Prior to the seventeenth century, few British citizens were familiar with the taste of sugar, yet by the late nineteenth century it had become a staple in the British diet. This rapid increase in the production and consumption of sugar can be attributed to a variety of factors, but capitalism, slavery, and sugar’s relationship to other popular stimulants are particularly worthy of examination. As an important marketable commodity, sugar was integral to the growth of capitalism in Britain. In the early to mid-1600s, it was only accessible to the wealthy elite. This was due mostly to the fact that sugar was so difficult to grow, which kept quantities limited and prices high. Sugar cane was brought to Britain’s first New World colony in 1619, but attempts to get it to grow were unsuccessful, much as they were in Bermuda a few years earlier (Mintz 37). Britain was finally successful growing sugar cane on the settlement of Barbados, and plantations in Jamaica and on other islands followed soon after. By 1655, enough cane was being processed that, “the sugar production began to benefit the homeland” and became, “an imperial source of profit” (Mintz 37). With this sudden boom in sugar production, Britain soon became competition to and eventually surpassed the Portuguese producers, driving prices down (Mintz 64). In recent decades we have seen the Industrial Revolution give way to computer and information technology, leading to massive change in our economic structures. Similarly, the Commercial Revolution, in which English merchants found themselves able to earn profits as middlemen in a growing shipping industry for sugar and tobacco, was a departure from the feudal method of production that gave way to capitalism (Mintz 65). 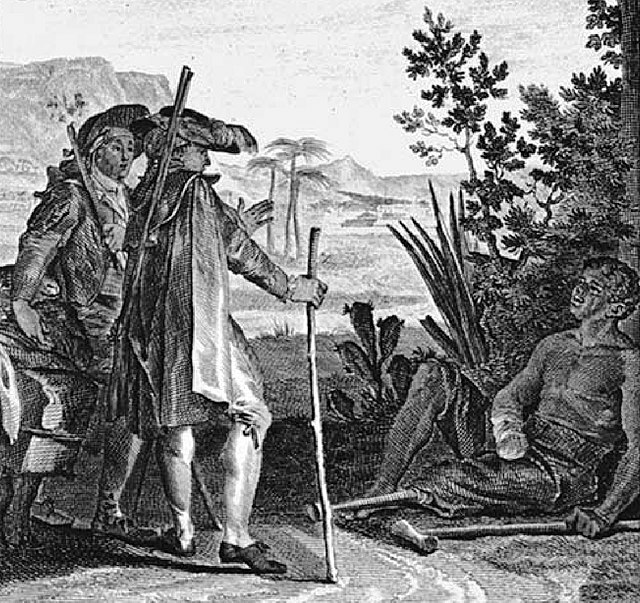 Depiction of a scene from Voltaire’s Candide and Cacambo, encountering an injured slave. “The caption says, ‘It is at this price that you eat sugar in Europe’. The slave that utters the remark has had his hand cut off for getting a finger stuck in a millstone and his leg removed for trying to run away” (Moreau). Slavery was instrumental to increasing the production and consumption of sugar, developing as a byproduct of early capitalism. Without people to do the physically grueling work of cutting down and processing the cane, the production and distribution of such colossal amounts of sugar would not have been possible. “263,000 [African] slaves were imported to the English islands, about half going to Barbados alone” (Martin). Enslaved persons on these island plantations worked long, 18 hour shifts, and had a very low life expectancy rate – only 7 or 8 years (Martin). Slavery continued through the end of the 19th century, when a combination of revolting slaves, abolitionists, and the introduction of modern machinery finally put an end to the majority of forced labor in the sugar trade. The sugar production boom of the 1600s and subsequent falling prices led to a flood of sugar on the British market, as it became affordable and readily available to nearly anyone who wanted it. Demand for sugar stayed high despite the market saturation in part due to the popularity of tea and coffee. Not only did the addition of sugar counteract the bitterness of these drinks, but it added extra calories to the diet of the British worker, which was both, “calorically and nutritively inadequate and monotonous” (Mintz 183). The popularity of adding sugar to sweeten bitter tea or coffee is a tradition that continues to this day, and was a critical factor in Britain’s continued demand for more sugar. Many other factors contributed to the development of Britain’s sugar habit. Sugar has even been labeled physically addictive, stimulating, “the same pleasure centers of the brain that respond to heroin and cocaine” (Cohen), something that may help explain peoples’ insatiable desire for the taste of sweet. A comprehensive understanding of the significance of sugar to our modern industry should consider all of these factors and more. But by examining the role sugar played in the birth of capitalism, the forced labor it required to thrive, and the social decadences of the time, it is easy to recognize how sugar came to be so widely produced and consumed, by Britain and by the rest of the world. About.com. “Proper Etiquette for Afternoon Tea in London.” Online video clip. YouTube. YouTube, 18 Jun. 2012. Web. 13 Mar. 2015. Martin, Carla. “AAAS E-119 Lecture 6: Slavery, Abolition, and Forced Labor.” Google Slides, AAAS E-119 iSite. 4 Mar. 2015. Web. 12 Mar. 2015. Mintz, Sidney W. Sweetness and Power. New York: Penguin Books, Ltd., 1985. Print. Sugar was first brought to Europe from the Spanish Canary Islands by Christopher Columbus in 1493 after which an acquaintance with the product by European locals spread throughout the region. Due to the changes in supply of sugar to Britain in 1627, there were historical changes in the use of sugar by the British population as it went from being a luxury product for the elites at first but then used by the normal person for various purposes such as a spice/condiment, as medicine, as decoration, as preservative, and as a sweetener. Sugar was almost an exclusive product when the Europeans started to colonize the “New World”. 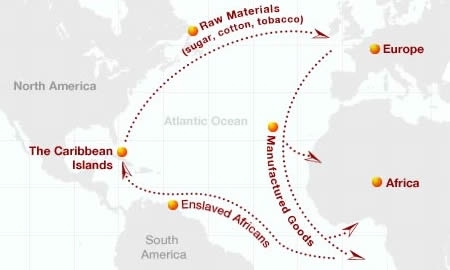 Due to the establishments of British colonies in the West Indies and exploitation of slave labor, sugar production soared then where the product was exported to European countries such as Britain. As mentioned, the decreased the price of sugar allowed for the common person to have a taste for sugar. Once sugar hit the streets as a normal product, the usage of sugar became a necessity for many as the working class benefited from the surge of sugar imports from the colonized West Indies. Due to the changes in supply of sugar to Britain in 1627, there were historical changes in the use of sugar by the British population as it went from being a luxury product for the elites at first but then used by the normal person for various purposes such as a spice/condiment, as medicine, as decoration, as preservative, and as a sweetener. “Sugar Facts.” Domino Sugar, n.d. Web. <https://www.dominosugar.com/family-fun/sugar-facts&gt;. Mintz, Sidney W. Sweetness And Power: The Place Of Sugar In Modern History. New York: Penguin, 1986. 37-38. Print. “The Transatlantic Slave Trade.” Overview. Inmotion Aame, n.d. Web. <http://www.inmotionaame.org/migrations/topic.cfm?migration=1&topic=1&gt;. Satre, Lowell J. Chocolate on Trial: Slavery, Politics, and the Ethics of Business. Athens, OH: Ohio UP, 2005. 18. Print. Smyth, Brendan. “Early European Imperial Colonization of the New World.” The Gilder Lehrman Institute Of American History, n.d. Web. <http://www.gilderlehrman.org/history-by-era/imperial-rivalries/resources/early-european-imperial-colonization-new-world&gt;. “Slave Trade Map.” Discovering Bristol, n.d. Web. <http://discoveringbristol.org.uk/images/sized/images/uploads/slavery/c_map-450×270.jpg&gt;.